Given all the circumstances surrounding the club, it’s a miracle Tottenham Hotspur have been able to achieve what they have this season. A lack of summer transfers has greatly affected their depth, limiting Mauricio Pochettino’s hand when it comes to rotating his squad during the three domestic competitions and the Champions League. They’ve done a nice job maintaining positioning in the Premier League, currently five points off the top two and with nine points ahead of fourth place Manchester United. Spurs almost missed out on the Round of 16, narrowly squeaking by thanks to a late draw against Barcelona in the Camp Nou. The injury bug hasn’t been kind to Tottenham this season either - Harry Kane and Dele Alli have missed considerable amounts of time with injury, and Ben Davies has picked up a knock as well. With the number of injuries they have had, it doesn’t help Spurs are facing one of the more offensive teams in Europe. It’s been a youth revival for Borussia Dortmund so far this season. 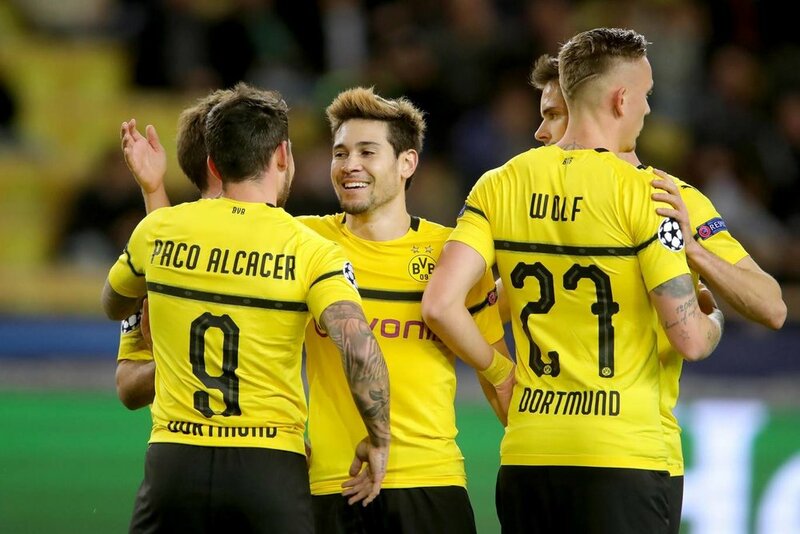 Behind the efforts of Jaden Sancho, Christian Pulisic, Achraf Hakimi, and Abdou Diallo, Dortmund have found themselves atop the Bundesliga and in the knockout stages of the Champions League. They breezed through the group stage, losing just one game and finishing first thanks to beating out Atletico Madrid on goal difference. Dortmund is still hanging onto a five-point lead in the league despite Bayern Munich gaining momentum fast. It doesn’t help Lucien Favre’s team that they haven’t won in the month of February yet. They had two draws against Eintracht Frankfurt and an astonishing 3-3 result against Hoffenheim where Dortmund allowed three second-half goals to drop points. Those results sandwiched between a shootout loss to Werder Bremen in the DFB Cup has made it a sour start to the month, but doesn’t mean Dortmund will be pushovers. Sancho has taken Europe by storm, capturing the world's attention as one of the generation’s future superstars. He’s scored seven times and dished out nine assists in his 21 games in the Bundesliga this campaign. With Davies out on the wing and Spurs already inconsistent play at the wingback spot, this could be a tricky matchup for Tottenham to handle. One wrong move and Sancho will be slinging passes into the box. Given Paco Alcacer’s career revival at Signal Iduna Park, Dortmund have a real threat in front of goal. While they will be without Marco Reus for this game, BVB still should be favorites in this one. For Spurs, the offensive load has been carried by the duo of Cristian Eriksen and Heung-Min Son. The latter has been one of Spurs’ best threats in front of goal over the past three years, scoring 37 goals for the club. However, he hasn’t had much success in the Champions League this year, going scoreless in his four appearances. Son has missed some time due to international duties and he has still done well to get back acclimated with the squad. He can play on either the wing or up top at striker. With Son’s pace and Eriksen’s pinpoint ability to pick out passes, Spurs still are a threat to this Borussia Dortmund’s defense. Dortmund’s backline hasn’t had its fair share of good fortune when it comes to staying healthy as well. All it takes is one mess up and Spurs will have the advantage at Wembley. This is an old school tie between two of Europe’s most historic clubs. Both Ajax and Real Madrid have enjoyed European success with the latter running the show in the Champions League as of late. No matter what their standing was domestically, Los Blancos always flipped the switch when it came to Europe. It initially didn’t look like things would be this way for Real Madrid once again when you consider how their season started. After his controversial exit from being the manager of the Spanish National Team, the pressure was all on Julen Lopetegui when he took the Real Madrid job. It was also clear Real Madrid weren’t prepared for the departure of Cristiano Ronaldo and the scoring output he brought to the Bernabeu. The offense suffered, Madrid fell severely behind in the La Liga standings and Lopetegui was sacked following a 5-1 thrashing in the Camp Nou against Barcelona in El Clasico. To make matters worse, they suffered an embarrassing 3-0 defeat to CSKA Moscow on Matchday 6 in the group stage. Santiago Solari has taken over and has since turned things around, revitalizing Real Madrid in the new year. They have since jumped up to second in La Liga, six points behind league leaders Barcelona. Gareth Bale, Luka Modric, and even Karim Benzema have seen an uptick in production. Vinicius Jr. has proven to be a real threat on the wing and has given opponents problems any time he steps on the pitch. Real Madrid got two key results in a draw in the first leg of their Copa Del Rey and got a 3-1 win on the road against Atletico Madrid. After a couple of months of turmoil, it looks like Real Madrid are back on track. Ajax has been a surprise team in Europe so far. In a group with Bayern Munich and Benfica, Erik ten Hag’s squad got some fantastic results in the six matchdays. Two draws against Bayern, one draw and a win against Benfica later and Ajax were through to the Round of 16. Things are picking up in their domestic league as well. They are only six points behind PSV Eindhoven in a two-horse race in the Erividisie. In terms of threats going forward, former Southampton Dusan Tadic has seen himself really become a key cog in the Dutch’s club attack. Starlet Matthias de Ligt and former Manchester United CB Daley Blind are the two main defenders in charge of making sure Bale doesn’t go rampant in the Amsterdam Arena. A 6-2 loss to Feyenoord and a 1-0 loss to Heracles weren’t the best results to have in the weeks leading up to this game, however. A couple of weeks ago, this could have been the chance for a major upset. However, things have regressed to the mean. Real Madrid has gotten better while Ajax has been hit by the injury to De Jong. Madrid will be looking to make a statement and Ajax will be holding on to dear life to stay into this tie.